Harry Truman was a bank clerk, postmaster, haberdasher, and 33rd president of the USA. Assuming office in April, 1945, Truman oversaw the charter-writing meeting of the United Nations, Germanyâ€™s surrender, and the bombing of Hirishima and Nagasaki. His two terms in office, with the establishment of the Truman Doctrine, the Marshall Plan and NATO, set the course of US foreign policy for decades to follow. His continual pursuit of social and economic reforms kept them viable for future action. A great Mason achieving the 33rd degree. 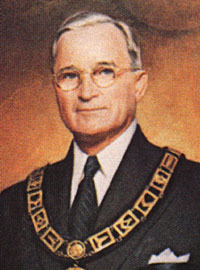 If you can find a copy, Allen Roberts' book, "Brother Truman" is an excellent biography of Brother Harry, focusing on how his life revolved around Freemasonry. I found a used copy on Amazon, it was one of the first Masonic books I sat down and read, and I still refer to it on a regular basis. Lots of good stories in here, in Truman's early years in the Craft, he was still a farmer, and practiced his lectures and ritual while walking behind a mule, plowing fields ;-) It must have worked, it wasn't long before Truman became a Master, and subsequently a district lecturer. While traveling as President, he would often slip off to a local lodge for stated meetings and degrees, and often called upon to confer, which he did in flawless (Missouri) style. How cool would it be to say that you were raised (or initiated) by the President? I love the story of how he made his Secret Service detail stay outside the lodge because they weren't Brethren and he felt it was the safest place he could be. Warrior1256 and drw72 like this. "As the 33rd President, this 33rd degree Mason initiated the Nuclear Age, the crowning success of alchemy, when the first A-bomb exploded at the 33rd Parallel Trinity Test Site, (Almagordo) White Sands, New Mexico. He was responsible for killing of thousands of Japanese (the Yellow Peril) at two cities close to the 33rd Parallel, Hiroshima and Nagasaki on August 6, 1945 (Hiroshima) which was 33 days after July 4, 1945." I heard this too and loved it! Spoke too soon. I just knew that there would be more than one kook out there that would jump on this 33rd degree and 33rd president. I too like the Secret Service story. There is also another one about Donald Earl Bauermeister who Br. Truman Raised (while on campaign) and remained friends with the rest of his life.